It was a powder day in Tahoe. For ski aficionados a dusting of fresh powder means you drop the rest of your life to get on the mountain. That day we had more than dust. It was four feet of white smoke. I left my Truckee house without making coffee, greedy for frosty adrenaline. This girl didn’t need caffeine. If I were alone I would have skied all day, not stopping for nourishment or bodily functions. Not only was half of San Francisco on the roads with me, but I was also driving with my best friend Plum. She was just as excited to ski as I was. However, she had a hard stop midday — she had a new puppy we had to get back to. At 7am ‘Midday’ seemed like a galaxy far, far away. However, when the time came to stop skiing and head back to the car, I had a meltdown resembling a surly three-year-old…or our new President. “BUT I WANT TO SKI MORE….” I said. “But we can’t. We have a little pup to get back to…” said Plum. My mind raced to come up with other solutions. Nate was on the mountain…somewhere. If he wasn’t stuck in an avalanche he could drive me. Or I could hitchhike…if I didn’t get stuck in an avalanche myself. Maybe I could cross country ski back the 25 miles to the house….Plum could drive my old car safely right? She was right. We had a deal. Midday. Plus we had been skiing powder together for 10 years. There would be another powdery afternoon. But if I stayed on the mountain solo today, there might not be another 10 years of friendship. Any relationship, whether it is platonic, familial, or romantic is built upon a series of compromises. The more people we have in our life, the more compromises we have to make. What time we meet up (everyone has different yoga schedules). When it comes to ski trips, it isn’t just the end time that requires compromise. Departure is also “flexible,” just like my après-ski alcohol tolerance. Based on my ski house calculations, one must add 15 minutes of delay for each additional member in the group. Someone always has to pee again, find their left mitten, or check facebook while there’s still reception. It’s annoying, sure, but it’s the price you pay to have a chairlift buddy. If we always did exactly what we wanted according to our own needs and timeclock, we’d get a lot more done and have extra hours of fresh powder dives. But we’d also be lonely. Over the past 10 years I’ve had plenty of surf and ski days on my own. I did exactly what I wanted when I wanted. But I can never quite remember the day’s details afterward. Sometimes I wondered if the day happened at all. Yet all the times I’ve had adventures with a significant other or a group are imprinted in my brain like an Instagram shot. When I’m solo things just don’t seem as photo-worthy…unless it’s to send a snapshot to a friend, wishing they were there with me. The best thing about a Tahoe powder day isn’t actually the skiing. 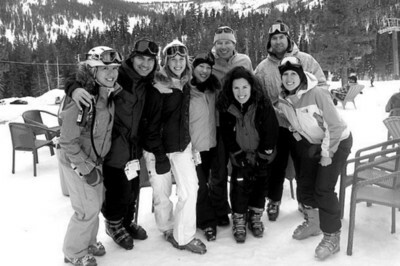 It’s talking about the skiing with your friends over a 4 p.m. beer, reminiscing about the awesome time you had together, and adding more photos to your ongoing scrapbook. On the day Plum and I left, we spent the afternoon playing with her new puppy and excitedly talking about the next time we could ski together. It was good to leave wanting more. Scarcity is the heart of desire. Desire fuels further adventures. Finger Lickin’ Freedom: 4 Things I Love About America….